🎙 Please keep that feedback coming on the Pro Rata podcasts. Episode #2 is up, focused on the exaggerated death of local news, with #3 coming in a couple hours. Subscribe and listen via Apple or other platforms. Fuel cell maker Bloom Energy last night priced its IPO, raising $270 million by selling shares at the top of its $13-$15 price range. That gives it an initial market cap of nearly $1.6 billion, compared to around a $3 billion private market valuation back in 2014. But the big story here isn't the value haircut, or even that Bloom keeps hemorrhaging cash more than five years after its CFO told me (and prospective investors) that the company was on the verge of profitability. [The placement agents] Mr. Badger and Mr. Daubenspeck had threatened to sue Bloom Energy in 2013, claiming that the company misled them and caused them to get sanctioned by the SEC, according to people familiar with the dispute. Bloom Energy denied those allegations, the people said, but settled with Mr. Badger and Mr. Daubenspeck. The company recorded $16.7 million in charges to settle the dispute... [which] covered Bloom granting the men the post-IPO shares, as well as hundreds of thousands of preferred shares and warrants, and a $5 million low-interest loan, according to a 2015 Bloom Energy financial statement reviewed by the Journal. Then Bloom disclosed last Friday that the pair is "seeking to compel arbitration and alleging a breach of a confidential agreement" related to the settlement. And Badger reiterated that position to me yesterday via brief phone call, saying only that he would gladly waive the confidentiality agreement were Bloom to agree. Why it matters: Bloom will neither agree to waive the confidentiality agreement — nor even get on the phone to discuss these issues — raising an obvious question… What’s it hiding? And who bought into this IPO (at the price range top!) with even the vague possibility of skeletons in Bloom’s closet? Guild Education, a Denver-based education benefits platform for Fortune 1000 companies, raised $40 million in Series C funding led by Felicis Ventures. Why it's the BFD: Because while many startups are effectively designed to displace workers (via automation, etc. ), this one is seeking to help over 60 million front-line employees get the degrees and credentials needed for better-paying jobs. Guild also recognizes that traditional data sets for higher-ed fail to include factors like which schools are best for working adults, those caring for families, etc. Oh, and it's the largest investment in Felicis' 12-year history. Other investors: Salesforce Ventures, Workday Ventures, Rethink Impact & Education, SVB and return backers Bessemer Venture Partners, Redpoint Ventures, Harrison Metal and Cowboy Ventures. • Grubhub (NYSE: GRUB) has agreed to buy LevelUp, a Boston-based mobile diner engagement and payment solutions platform, for $390 million in cash. LevelUp had raised around $100 million from firms like Highland Capital Partners, GV and T-Venture. • Brian Nobis has joined the State of Wisconsin Investment Board as a senior investment officer for private equity. He previously was with Liberty Mutual and, before that, the Illinois Teachers’ Retirement System. 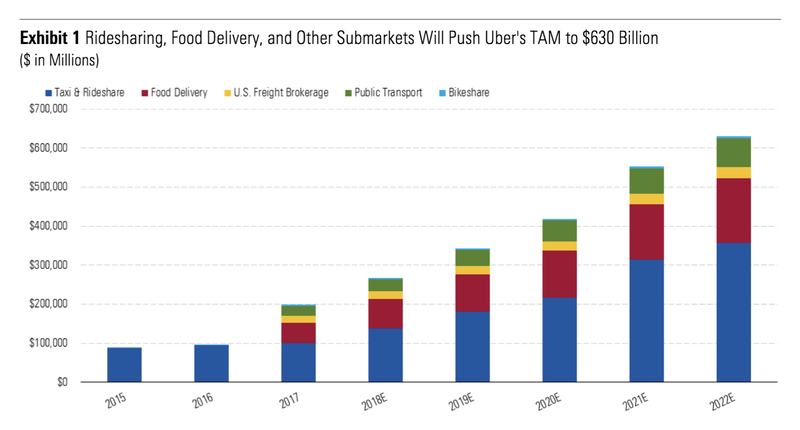 "We value Uber's total addressable market, which includes the aggregate of the global taxi, rideshare, and food delivery industries along with the U.S. markets for freight brokerage and the share we believe rideshare companies can take from global public transport and U.S. bikeshare, at $630 billion by 2022, representing a 26% five-year compound annual growth rate."